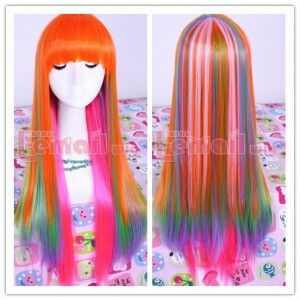 It is recommended to fluff and run fingers through wig to get out loose fibers before earing. Teasing it can create a cute fluffy style. Bangs may need to be trimmed to suit your own face.. Wig net has two elastic belts built in to shorten the circumference if necessary. Fibers are heat resistant, but we don’t recommend heat styling unless you have previous experience or professional help. Temperature range is 250-300°F (120-150°C) for hot irons, 160-175°F (70-80°C) for hot water.